There's a Card for That: Layered in Blue | ft. Altenew "Totally Tropical"
I gotta say, this particular Muse had me stumped; but what really drew me in were Kim's colours. The purple of the bird over those beautifully layered flowers is just beautiful. With every challenge, I like to put my own spin on things, but I didn't know what I was going to do for this one. I sat and I thought and I thought and then I remember! I have the most amazing layering set from Altenew that I have been dying to play with and I felt that this was the most perfect opportunity! I've mentioned before that I'm extremely new to layering stamps and to be perfectly honest they frighten me. I'm always so surprised by how they turn out. To begin, I stamped the solid stamp in CTMH Sky ink, then the detail stamp in Gypsy. These stamps have holes in the centre - maybe so you can line them up, I don't know. So I took the outline stamp and sponged on Pacifica ink to the middle and put that over top. For the leaves I used Sweet Leaf and then Pear inks, also from Close to my Heart. The greeting is stamped with Memento Tuxedo Black. The middle flower on the right side got lost between the other two, so I lined up the outline stamp again, and stamped the whole thing with Pacifica. In retrospect, I think I should have stamped it off once and used a second generation stamping for the outline, but... hindsight, am I right? Finally I matted the panel on to a medium blue piece of cardstock then adhered it to a standard A2 sized card base. Then of course, me being me, and I just can't leave well enough alone, I used some Pico Embellisher - the Wedding Dress irRESISTibles in the middle of each flower. My idea was for this to remain white, but it picked up the colour of the ink and I'm glad it did. This looks nicer. Just beautiful...love your sweet blue flowers, they look amazing! 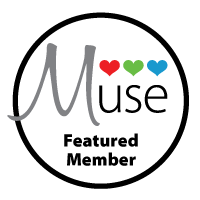 Thank you so much for playing along with us at Muse this week! Your card is so pretty. 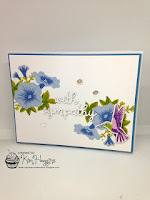 I love those beautiful flowers, and your card has such a happy and festive feeling. So light and fresh. Love it!